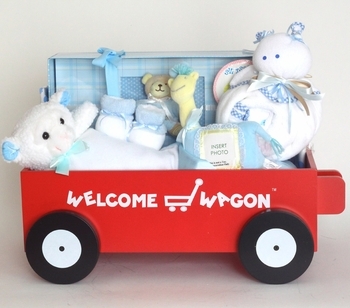 The Little Lambs Baby Gift Wagon is a beautiful newborn baby boy gift to welcome him home from the hospital! The little red wooden wagon measures 23 by 10 inches and includes the cutest gifts that will delight the parents and the new baby! At the heart of this design, we feature a large keepsake photo album to capture his first year in pictures. It measures 14 by 9 inches and holds up to 120 8.5 by 11 pages and is accented by a plush wrist rattle on the cover. Once the rattle is removed, a photo of the baby can be inserted in its place to personalize the album. Beautifully gift wrapped and ready to give!